We may be witnessing a very important shift in the character of the Republican Party. For decades now, it has tended to nominate very established names for president. The party nominated Richard Nixon to its presidential ticket five times in 30 years. Over the last 20 years, there has been a Bush or a Dole on the ticket for all but this last presidential election. The Republican presidential nominee is almost always the front-runner, the established candidate, the guy who’s waited his turn: McCain, Dole, Bush Sr., Nixon. The Democratic Party, by contrast, tends to nominate the outsider: Obama, Clinton, Carter and Kennedy. If history is the guide, this means the Republican Party will nominate Mitt Romney for president. He is the establishment candidate; he has run before; he is the most mainstream figure in the party. But I get the sense that the Republican Party is changing. Power has shifted to the South and West. The energy of the Republican Party has moved away from the coasts and the big cities. Power has also shifted away from the proverbial smoke-filled rooms to the grassroots. The forces that represented the establishment in the Republican Party - the big corporations and the banks - are much weaker. The forces that are strong today are Christian conservatives, libertarian activists and other more diverse, populist groups. These groups have always existed but before now they were directed by the coastal elites. Not anymore. The tea party represents the dramatic acceleration of these forces. That’s why all the Republican presidential candidates are trying to take up the mantle of the tea party. These forces are elevating Rick Perry such that we may end up with a situation where all the energy, enthusiasm and numbers are behind him. It would not matter that the Republican establishment was behind Romney because that establishment no longer controls much. What matters is the entrepreneurial game of getting people and money. Perry seems to be doing pretty well at that. 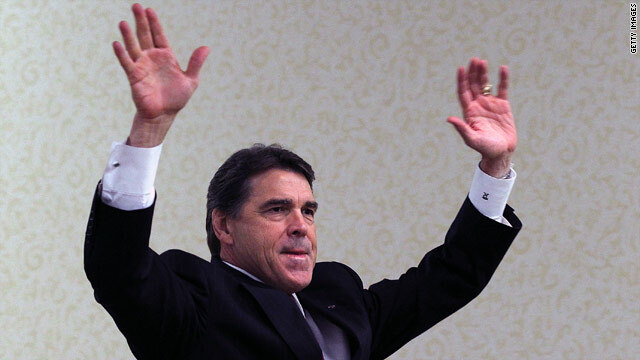 If Rick Perry does emerge as the front-runner, it is not just the story of one guy doing well; it is the story of a very different Republican Party than the one we have been familiar with for the last 30 or 40 years. It would result in a Republican Party with greater energy, enthusiasm and street cred, but also one that is more extreme, uncompromising and much less concerned with being dismissed by the mainstream media or characterized as irresponsible by people like me. It will make for a more difficult political system because these are the forces that have been very reluctant to compromise. We may find that the debt showdown was just the beginning. "Perry's rise shows shift in GOP" A shift to validate the Republicans hypocrisy. Texas's debt is around $27B and growing. Perry is borrowing money from the federal government he criticizes to help pay his states debt. A state I might add has one of the most valuable resources. How can Perry bring down the country's debt if he can even figure out how to pay his states debt. If Perry is selected as nominee it would prove they have no plan or intrest in controling the debt. One of the keys to controling the debt is Congress and their ear-marks like the ones the Senators of KY – squirrels, TN – Corvette simulator and WV – Roman bath renovation attached to the FAA budget. If 535 people in Congress will spend and waste more of our money than 1 person in the White House. Republicans you have got to shift your focus and it is not the White House or nothing is going to get fixed. FREE Oil Trading Room: The time has come for me personally to demonstrate the secret code for FREE twice per month in REAL TIME inside my online trading room. I will show that I know which direction oil is going to go over and over and over again without end. You are all invited to watch a scientist demonstrate how the oil market trades via a computer program. Google Oil Trading Academy to learn more. Does the republican party have any members that are not total nutcases? I would be interested to know. It's time that the American main stream media acknowleges en mass the fact that the tea party is a form of brain-washing of unprecedented proportions! You can see the lust for power in his eyes. If I believe that I right, why should I compromise? Picture of Baby Killed by Abortion; picture of Barrack O'bummer; picture of Hilary ( silly hilly billy ) Clinton; picture of another Baby Killed by Abortion. Repent, before you go to hall! Fareed, the world has seen before how a nobody from Austria dominated Germany by guiding resentment and ignorance, and what took to remove and the aftermath onwards. Let this not happen in America, the beacon for liberty! Why not vote for Ron Paul? What a perfect shot! That's one scary looking dude and from what I've heard him present as to what are his politial views and stance the fear is just compounded.! And by what attributes do you think he qualifies for the seat of president? You actually make it seem really easy with your presentation however I find this topic to be actually one thing which I feel I'd by no means understand. It sort of feels too complex and very huge for me. I'm having a look forward to your next post, I'll attempt to get the hold of it! Republicans are owned by Tea Party crazies and Fox News.